Discussion in 'Clickbank' started by nishat, Dec 22, 2013. 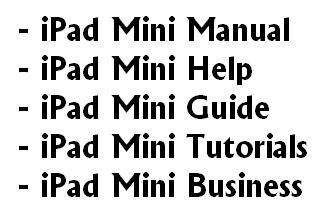 Mike's Mini Lessons is a video course of over 100 videos for iPad Mini owners which shows them how they can do absolutely ANYTHING they want on the iPad Mini - ranging from how to use all the apps, tips and tricks, hidden features, plus plenty more.These are high quality original videos that can't be found anywhere else. This niche is GINORMOUS (I'm talking MILLIONS!) Already, on Clickbank there are Video Lessons products for the standard iPad which are KILLING IT! But that niche is so crowded now that it's hard to stand out. You would be competing against thousands of other affiliates. This niche is MUCH BETTER! In 2013, http://www.theinquirer.net/inquirer/news/2277029/apples-ipad-mini-makes-up-60-percent-of-ios-sales, completely outselling the larger iPad and the iPhone. More people are buying iPad Minis than the standard iPad now! Plus, old people LOVE the iPad Mini because it is so easy to hold, and slightly cheaper than the standard iPad, and they are BIG CUSTOMERS for these types of Video Courses. I'm offering you 75% commission for promoting the product. The product sells for $77 - and you get 75% commission. That means you get around $52+ a sale! Think about how many people around the world will be receiving an iPad Mini as gift this Christmas - MILLIONS! Get your campaigns UP NOW! Plus, I'm giving $100 cash bonuses to EVERYONE who gets 10 sales during any time period. Not bad hey? Start promoting now! You are right about the Christmas thing! I already know 4 people getting iPad Minis as gifts - and that is just in my family! I'll give this a shot and try get that Christmas shopping rush! 1 in sale 1 day so far. Very happy, to say the least. I know like 20 people who would buy this. Going to set up a blog and Youtube channel for this. Great niche and nice looking site! Thanks guys. This is no doubt a home run hitter for any affiliate looking to make money. After all, $52 a sale plus CASH Bonuses! site seems to be good for me! I'm gonna give this a chance for a little and see where it goes! This is one of the best looking Clickbank products I've seen. Everything is very well structured and the sales pitch is really really good. This should be a big HIT for 2014. Setting up my Adwords campaigns now. I see this becoming a big seller. Your niche is a very smart choice. How did you come up with it? I've promoted just regular iPad Lessons and earned good money, but targeting this specific segment is genius! There are millions of people with iPad Minis! I'll do set up some landing pages and see how this goes. By the way, thanks for the abundance of affiliate resources. It's a rare thing these days to find a Vendor who makes it that simple to promote their product. 2 sales in 2 days so far! is it only me or does anyone else thinks the obvious ? Have to admit, it did cross my mind too. Anyway OP, Good Luck with sales. is it only me or does anyone else thinks the obvious ?. Can you explain what you mean as I am a bit green. Most Clickbank products have free alternatives. One of the best selling products on Clickbank right now is a video course for the regular iPad - and there is plenty of information about that online for free. But people still buy it. The same applies to all the bestselling weight loss guides, how to get girls etc. It shouldn't make a difference if there is free information out there. Do you have an insight on what kinds of promotion would work best for this - email blasts, YT, review sites, forums, etc...? Next to that, Youtube promotion (videos, channels, tips & tricks) would be very effective. Those keywords get good searches with low competition. Highly recommended. Just had my first sale ever on Clickbank with this product! Hey man just wondering , when searching for this on clickbank it said avg sale $9 is this a bug ?